My introduction to St. Petersburg, Russia based The Grand Astoria was through their contribution to the Fruits de Mer Records Strange Fish compilation and a cover of Can’s Oh Yeah to the Fruits de Mer Roqueting Through Space collection. 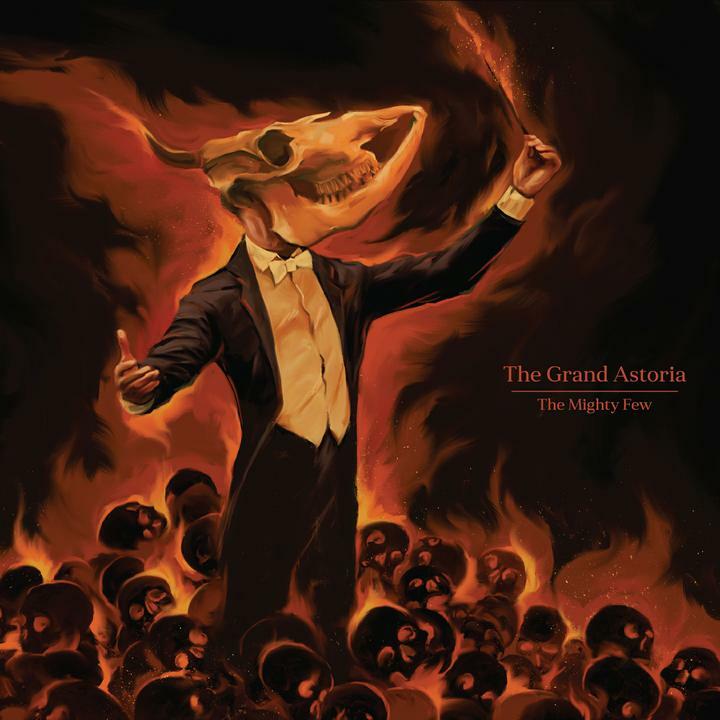 Headed up by Kamille Sharapodinov (who does double duty with his Organic is Orgasmic project), The Grand Astoria includes multiple musicians on guitars, keyboards, synths, Rhodes, piano, flute, clarinet, trumpet, saxophone, drums and percussion. The Mighty Few is their latest and consists of two epic length tracks. The music defies simple description as The Grand Astoria incorporates multiple stylistic influences, both in combination and as they transition through multiple themes. The 28 minute Curse Of The Ninth kicks off in atmospheric Doom-Jazz mode, if you can envision that description. But what starts off led by sax and Rhodes quickly switches gears as the band launches into a Stoner-Metal dirge with solid rocking vocals and cool fuzz-wah’d Psych guitar. But nothing sits still for long as an abrupt flute and acoustic guitar transitional bit leads to a steadily rolling Prog-Jazz jam that retains a wee bit of the tension-laden stoned vibe and includes trippy soundscape guitar embellishment. I really dig the use of the Rhodes and clarinet. Nice male and female vocals. The compositions and arrangements are sophisticated in grand Prog tradition, but there’s also a cool grooving flow that maintains a nice jamming feel. And sure enough, the band eventually veer back into Prog infused Stoner-Metal territory, which soon soars into space as the Psychedelic-Metal guitar and rhythm section gallop along frantically with schools of rushing synths and wildly oscillating electronics whizzing by. And on we go. Wow, 28 minutes of head-spinning compositional and thematic gymnastics that deftly integrates Prog, Jazz, Psychedelia, Metal and more. The 21 minute The Siege is next and starts off as a Prog, Space Rock and twin guitar Hard Rock and Fuzz-Metal edged rocker, which soon shifts to a funky Jazz groove and vocal number. My favorite part is the hair-raising Psychedelic Prog-Metal segment that’s like an orchestral marching battalion, which ends up going totally acid molten lava eruptive and sounds especially insane with the horns blaring along with the volcanic intensity. And when the assault subsides the music gets downright ambient meditative, before starting fresh with a spirited Prog instrumental with Jazz bits and spaced out effects. And just as the music is bouncing along with a spring in its step… BAM!! We’re slammed with a high powered symphonic Prog-Metal offensive. Ya gotta love these guys. If what I’ve described sounds like a lot of oddball transitions I can tell you that The Grand Astoria make it all cohesively connected and pretty damn exciting. Even with only the Fruits de Mer recordings to compare with there is clearly a lot of varied music that The Grand Astoria are capable of, and looking at their Bandcamp page there are a LOT of previous selections to explore.